Achieving intelligible speech reproduction in highly reverberant and acoustic complex spaces has never been easy. Over the last two decades Duran Audio has developed a comprehensive set of products to help Sound System Designers solve this problem. AXYS Intellivox and ABF products together with Digital Directivity Control and Digital Directivity Synthesis technologies have set new benchmarks in people’s perception of what can be achieved in these troublesome acoustic environments. 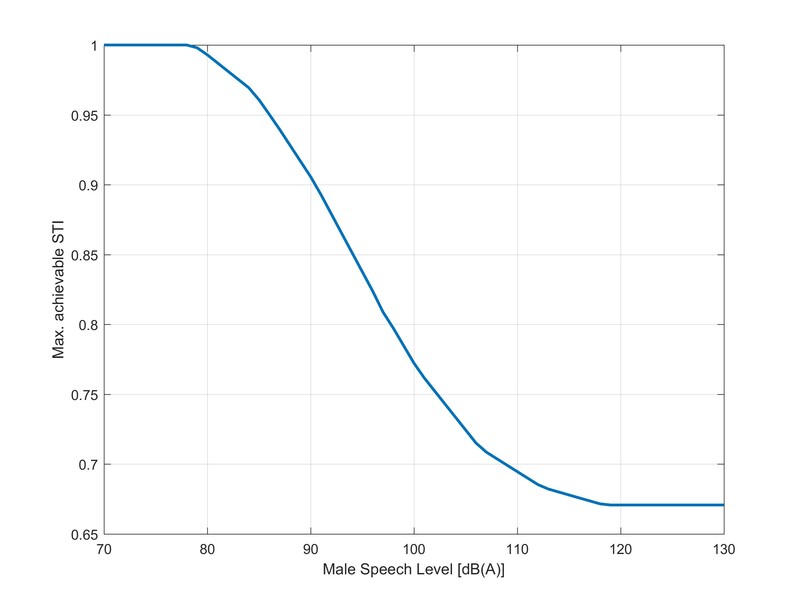 But what happens when a specification demands that you need to meet a specific STI (Speech Transmission Index), in difficult circumstances? For example, when a high Sound Pressure Level is required and you have a poor signal-to-noise ratio? Even with highly directional & low distortion AXYS loudspeakers, you face significant difficulties. Changes in recent years to the STI standard (IEC60268-16:2011) mean that you now get “penalised” when the sound level exceeds around 80 dB(A) (male speech spectrum). In fact if your system is operating at 105 dB(A) then the maximum achievable STI in an anechoic environment is around 0.72, and around 0.79 at 100 dB(A). So when you then factor in a space with difficult acoustics and high background noise levels then all of a sudden it becomes even more of a challenge to achieve a specified STI value. For example: PA/VA (Public Address/Voice Alarm) systems in Europe are required to achieve a rating of the space (i.e. : average STI minus standard deviation) which equates to a STI of 0.5. This criteria needs to be met with typical background noise levels present. This, in a busy road tunnel for example, could be as high as 90-95 dB(A). The sound system needs to operate at very high sound pressure levels to achieve a sufficient signal-to-noise ratio under these conditions. However, at such high levels the STI algorithm applies a penalty and increasing the signal-noise ratio (which would normally increase the measured STI value) further constrains the achievable STI value as the penalty is increased. In this situation the system equalisation could have a significant effect on the measured STI value! Duran Audio now offers AXYS users and System Designers the ultimate service to help achieve the highest possible STI from their system design. Using the AXYS OpSTImizer®; a PC based measurement and equalisation tool, our engineers measure STI using the STIPA method. 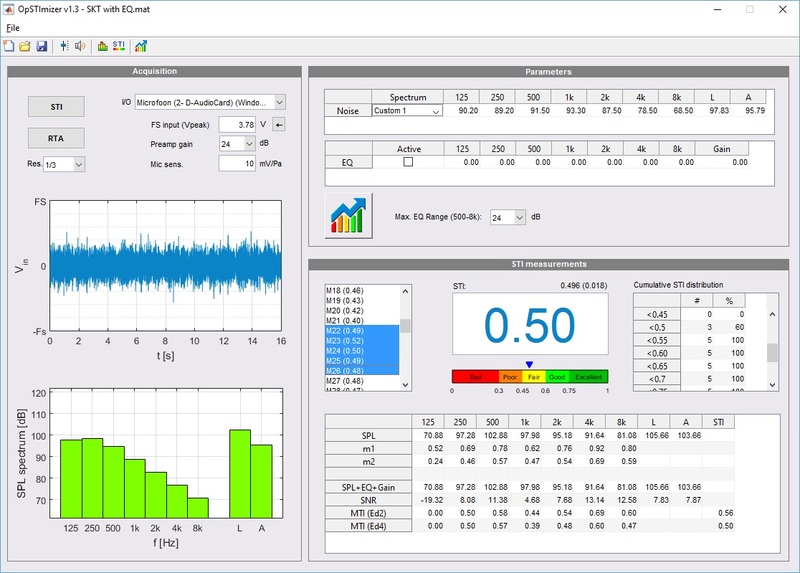 However, In contrast to most handheld STIPA measurement devices on the market, we can enter the background noise spectrum directly into the OpSTImizer®. There is no need for data export and post-processing in a spreadsheet, so we are able to evaluate the sound system's performance, under various noise conditions whilst on site. A further benefit of the OpSTImizer® is the ability to very quickly calculate an optimised EQ curve, which can be applied to the measured AXYS products. This maximises the achievable STI values for the defined background noise conditions. Finally, this EQ setting can be easily uploaded into AXYS IndustryAmp and Intellivox products and reviewed by ear. The OpSTImizer® service is now available as part of Duran Audio’s factory approved commissioning services. At present we are offering the service for AXYS ABF and IndustryAMP products.